What does dry ice, ethonal, wax beads, and a blender have in common? It was the first attempts at making media for this wax 3D printer that [Andreas] has been building up. Wanting to produce 3D printed objects out of metal, and finding that direct metal laser sintering machines were still out of reach of reason, he set out to find a different way. After trying a few different methods of making the powdered wax himself, he decided that it was much more time effective to just buy the stuff. Using the commercially available powered wax mixed with activated carbon, and a custom printer, the wax is blasted with a moderately high powered laser. More wax powder is applied over the freshly sintered layer, and the 3d part is built upwards. Once he has the part in wax, he can then make a mold of it and cast metal using the Lost Wax Casting method. While the quality is not perfect, and you still need a roughly 2500$ laser setup (which was borrowed from his school) its surely a step into the future. Has anyone ever attempted lost wax casting with water soluble PVA? That could be printed on a regular rep/maker/rapbot and encased in green sand and cast in metal. Sadly, there are not enough forge or foundry builds on HaD. There’s a guy at london hackspace who has used foundry sand to make casts based from PLA printed parts. That’s called “Standard Investment” if I am remembering my University Sculpture class correctly… of course… the less fancy name is probably “Sand Casting”… But either way, it’s a type of Investment Casting. I’ve heard that with wax technique with molten metal cast into form but instead of wax you can use regular PLA/ABS that would vaporise. You need to use PLA. ABS leave a residue when it burns off, which clogs up the mould. PLA doesn’t leave one and so gives cleaner results. It really depends on what he means by foundry sand. If you’re talking about greensand, (sand, clay, water, trace amounts of other stuff) you’re creating a negative mold that’s destroyed after you pour. A good setup can achieve 0.020″ accuracy… pretty good for a sand setup when that’s the average diameter of a grain of sand! The other method could be more like was mentioned with a “lost” process, where the plastic is consumed as the metal is poured. This sand is not bonded together, but rather just surrounds the lost object in a vessel. As was mentioned, residues can be an issue, but the bigger issue is the gas given off by the vaporising plastic. Compounds that give off relatively small amounts of gas are best, as they allow the metal to flow and fill the void quickly. 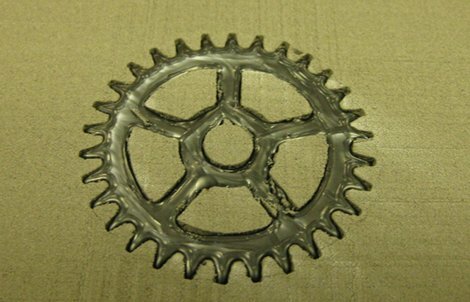 Thought I saw the makerbot site selling water soluble material that could be printed with a regular makerbot. Actually, regular additive 3d printing with plastic extrusion in layers might have produced as good or better result here. You can print parts on a standard Reprap Mendel type printer using PLA (polylactic acid) and use the same investment casting technique (“lost-PLA casting” I suppose in this case) :) Natural / undyed PLA vaporizes just like wax without residue. But machining foam, then doing lost-foam casting in sand, is a lot less fuss. I didn’t realise that this was so new. I figured the rep-rap could handle wax lol. It definitely would drop the cost of lost wax casting. Mix this with a cheapish CNC mill and you have all kinda fabbing fun. “It was the first attempts…”!? I wouldn’t normally comment on grammar or spelling mistakes, but you’ve ALL definitely been getting much worse recently. It’s become quite noticeable now. Where does the ‘$2500 laser system’ come in to use? He mentions that the IR laser diode used was bought on eBay for ~$100. .. now I see. The $2500 is for the laser driver. Actually I have the same diode off Ebay. They can simply be controlled by a constant current drive made from a lm317 and one resistor. No need for the expensive controller. True, however a couple of amps to drive a diode is really not something that should be ‘cost prohibitive’ to any hacker who’s worth his salt. I’ve seen people use common PLA for this (rings and such). Wouldn’t that be a simpler approach as there are plenty of printers out there suitable for PLA. I’ve watched some of his videos on vimeo, it would be nice if some non-time lapse were uploaded as I like to learn from watching something function, this is more like flipping through photographs. I like what he’s built, I’d like to try it myself. I was checking flea-bay, the Chinese are selling 40watt lasers that can be modulated for $250-500. What needs to be so special to need a $2500 laser?? The laser’s not that expensive, the power supply is. He just uses a high end commercial power supply that he already had access to, instead of trying to buy/build one for cheap (which can be done, he even mentions that in his writeup). Really it’s hackaday’s poor writing skills that seem to imply it’s required. It’s ethanol, no ethonal. This hapepns if yuo had too muhc. I like the water soluble PVA ideal. You would have to coat it with some casting mold compound that the water would not effect to wash it out. But you should be able to get great detailed parts if it washes out completely and easily too. Anybody know what “commercially available powered wax” is? I purchased the “commercially available wax powder” from . It’s Candelilla wax, which is a plant wax that had thermal and handling properties that made it suitable for my print powder. I suspect that it’s difficult to generate true ‘powdered’ wax and get the right ratio of wax to carbon. I’m also guessing that the carbon serves the purpose of absorbing the IR laser radiation and generating heat. Which makes me wonder: Why not use a pulsed laser to control the spreading of heat? You can get range-finder YAG heads (pulsed) on eBay relatively cheap as well. The repetition rate (~10Hz) might be the rate limiting step however. Why not just use the wax in a normal 3-d printer, modified to use a lower temperature than used for plastic and a chilled print bed? Print the object directly as the plastic machines that use spools of plastic do, instead of the sintering process at all? Personally, I’m a fan of “mill in foam; cast in metal”. For most home machinists, this is a much easier process and gives much better resolution and accuracy. Yeah, it’s an isomer of ethanol were the functional a and o groups are reversed. That had me sniggering like the chemistry geek that I am. Full marks! Seriously, the typos hurt my eyes. And english is not even my language !!! I think cheaper, more basic casting process can be used for something flat like this sprocket. The PVA from MAKERBOT is not a useable answer unless you are operating in a temperature/humidity controlled lab. The stuff absorbs so much moisture that it’s no good a couple days after you open the bag. I have a whole roll here that I can’t use. I was going to do lost PVA casting but it just won’t work. It is also very flexible and when you cast it in plaster the hydrostatic forces on the mold distort your original shape leaving you with a mess. I’m trying to build a new nozzle that uses wax. When using pva which has the problem of being water soluble, would painting the part after printing be a good way to form a waterproof barrier stop the part from melting or leeching into the investment plaster?